Math Mammoth Integers is here! Math Mammoth Integers worktext covers all important integer (signed numbers) topics for middle school (grades 5-8), with instructions written directly to the student. Thus, it requires very little teacher or parent involvement. More information and purchase info is here. Lulu.com has a special offer right now that you can use to purchase the printed copies of MathMammoth books. Enter coupon code HOLIDAYVIP305 at checkout and receive $20 off your next order of $20 or more. You can browse the printed versions of Math Mammoth books here. This offer is only valid in US dollars, and cannot be applied to previous orders. You can only use this code once per account, and you can't use this coupon in combination with other coupon codes. The offer expires on November 30, 2010 at 11:59 PM. Some of you (sports fans?) might find this interesting: mathematicians have calculated the quickest path around the baseball diamond, through the four bases. And it's not in the shape that you'd think. One more money-related book for Math Mammoth Blue Series... this time for Australian money. It covers counting coins, shopping, and making change, and is for grades or years 1-3. Please stop by the The Adventure Edition of Math Teachers at Play, posted at Homeschool Bytes. It's beautifully illustrated! Let the adventures begin! Did you know that Math Mammoth complete curriculum (Light Blue series) now comes with five different currencies? Of course, you only need to study through your own currency, but some of you might be curious to take a peek in the other monies as well - if nothing else, to see how their coins look like. For example, Australian money does not use 1-cent coins at all. The smallest coin they have is 5 cents. Or, British 50-pence coin is a heptagon in shape! Canadians use a 2-dollar coin nicknamed "toonie". It's pretty too. This news comes from the university of Wisconsin-Madison. The study author, Janet Hyde, says, "My message to parents is that they should have confidence in their daughter's math performance. They need to realize that women can do math just as well as men. These changes will encourage women to pursue occupations that require lots of math." I agree; parents AND teachers should never in any way imply that girls can't do the math just because they are girls. That's just not true! I also thought the mention of 48% of math majors being females was interesting. So, at least in pure math, genders seem to be quite equal. But I personally doubt that will happen in engineering because boys seem to be much more interested in that type of work. It took Marie 10 minutes to saw a board into 2 pieces. If she works just as fast, how long will it take her to saw another board into 3 pieces? The teacher marked this answer (20 minutes) wrong, and wrote down 15 minutes as the correct answer. Why is the teacher in error? The American Math Challenge 2010 is around the corner... Registrations are now open at www.americanmathchallenge.com. The actual event will take place over 48 hours, beginning on October 26, 2010 at 9 a.m. EST. This is a FREE online Challenge where U.S. students of all ages and skill levels compete against each other in a series of one-minute mental math games, as well as self-challenged curriculum-based activities. October 18 will open a "practice competition week" open to all registrants. Registration will close on October 22. Here's another one of those "guess my secret number" games where the computer tells what number you thought of originally. First you need to choose your "secret" number between 1 and 10,000. I thought some of you might enjoy trying to figure out how it works... I enjoyed it. By popular demand I want to share some of why it works. So DON'T READ if you want to think about why it works! In the LAST step, the computer guesses which digit you left out. For example, maybe you put in the number as 75x711. Now, the key to "guessing" or figuring out what the missing digit is, is the fact that this number is divisible by 9. Recall that before coming to this step, you had multiplied your number by 3, and again by 3. That means you multiplied it by 9, so it is now divisible by 9. This video explains my method for "structured drilling" of multiplication tables. We don't start with random drill (that comes later) but with drill that is using the structure of the tables. The tables are also practiced "backwards", which will facilitate the learning of basic division facts. 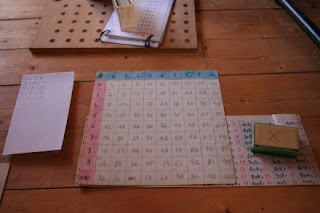 Over the years I have hears from many individuals who have gotten their child to learn the tables using this method, but recently I got word from a a principal of an English medium school in Pune, India, that they have already implemented my multiplication drilling method and it is working beautifully with their children! I feel flattered a whole SCHOOL is using it... and glad it is working.